For the 40 years that Hupy and Abraham has been in existence, the law firm has had one goal: to help those in need. This is true both in its legal work with accident victims and its charity efforts. The firm's impressive 40-year record of giving shows no sign of slowing. In fact, in the past three years, Hupy and Abraham has donated over half a million dollars to charity organizations. We have chosen to spotlight Hupy and Abraham's generosity as a way to thank its attorneys for their service to others and to encourage others to do the same. At Foster, it is our belief that any business that bases its business model not only on making money but also on giving to those in need is worthy of every praise it is given, and Hupy and Abraham deserves a standing ovation for all it has done. All families know that going back to school is an expensive event. And each year the team at Hupy and Abraham helps to make preparing children for school less of a financial burden for families in the Midwest. Each year, the law firm hands out hundreds of backpacks to area children. They have done this for five years. As soon as their back-to-school efforts wrap up, it's time to get ready for their holiday meal giveaways. 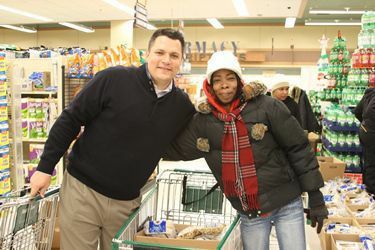 Before Thanksgiving and Christmas, Hupy and Abraham takes over grocery stores and local food pantries, giving out turkeys or hams, all the fixings and dessert to hundreds of families who aren't able to put a holiday meal on their tables. Also during the holiday season, Hupy and Abraham helps with several toy drives, including a large one in Chicago; see the image featured in this article. This particular toy drive was a huge success, with hundreds of children benefiting from the event. All of this work is in addition to the firm's Watch for Motorcycles, DNT TXT N DRV and Yield to Pedestrians public safety messages. The staff and attorneys at Hupy and Abraham run these safety initiatives on their own, using their own money, to spread awareness of these issues and save lives in the communities they serve. It is clear that Hupy and Abraham likes to think, and give, big. But before you get discouraged—after all, you just started your practice and don't yet have the resources to give big—keep in mind that Hupy and Abraham has had 40 years to come up with a giving strategy. So while we don't expect you to pick up and begin giving hundreds of dollars and hours every month, we would love to see you start, little by little. Begin building a legacy of giving that your partners, family, and community will benefit from for decades to come. If you’re up to this challenge, or if you've already started giving, please let us know. We would love to feature your efforts as part of our Foster Gives Back program. Just call 888-886-0939 or fill out a contact form to spread word about your charitable work and to increase awareness of the issues that are close to your heart.